This lusty, high spirited book came out of conversations, conducted over the course of fourteen years, between Frederico Fellini, the reknowned director of of such landmark films as "8 1/2", and "La Dolce Vita", and the author Charlotte Chandler. The result is a work of astonishing candor, subtle wit, and brilliant insight into the mystery of motion pictures. Federico Fellini (1920-1993) was an Italian film director and screenwriter, exerted a huge influence on the contemporary cinema. More than any other filmmaker of his era, Fellini transformed the realities of his life into the surrealism of his art. Began as an exponent of poetic neorealism, later he became the cinema's undisputed master of psychological expressionism and surrealist fantasy. His absurdist sense of comedy set him squarely apart from his contemporaries and at the peak of his career his work adopted a distinctively poetic, flamboyant, and influential style so unique that only the term "Felliniesque" could accurately describe it. Four of Fellini’s films won "Oscars" for best foreign-language film: "La Strada" (1956), "The Nights of Cabiria" (1957), "8½" (1963) and "Amarcord" (1974). 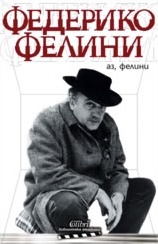 In 1993 Federico Fellini received an honorary “Oscar” in recognition of his cinematic accomplishments. I don’t make cinema, I make movies.